It's been only 3 months since the release of IE9 and Firefox 4 and yet here we are again. This time, with two new browsers, Firefox 5 and Opera 11.50, both with new rendering engines. I've split things into three parts. This first part is on Windows Vista browsers, the second on browsers under Windows7, and the third will focus on Ubuntu 10.10 browsers. * Identical builds to the previous test. We start with the (now standard) Peacekeeper test. First, the nice Peacekeeper graph, which orders them by score. The surprise is that SRWare Iron takes the top-spot. In fact, it was such a surprise, I re-ran the tests after I was finished, and came back the same. Of course, these scores don't give the whole picture, for that we need to see it broken down. Also, they don't include the canvas test in the final score, which does alter things slightly. 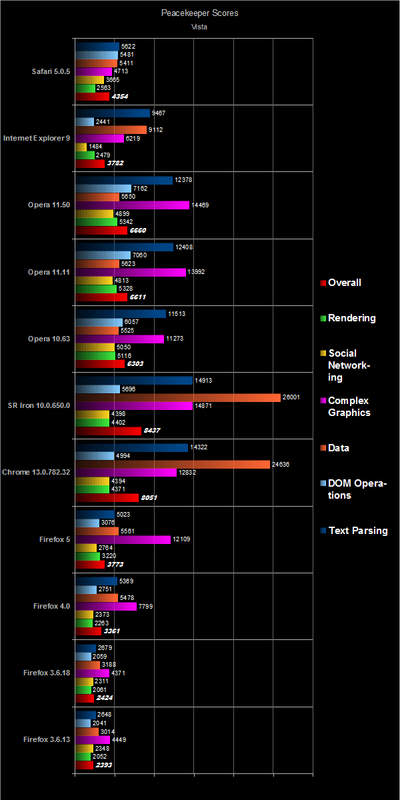 Accordingly, here's the breakdown of the scores, with the browsers grouped together. 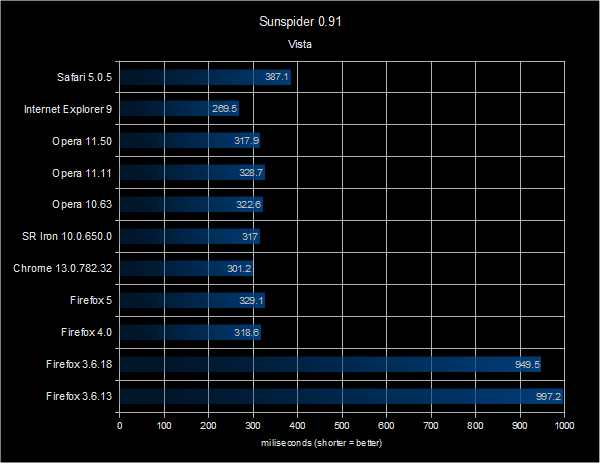 Here are the sunspider (0.9.1) results, again, ordered by browser manufacturer. To be honest, there's very little to chose here between the Chrome, Opera, and modern Firefox browsers. 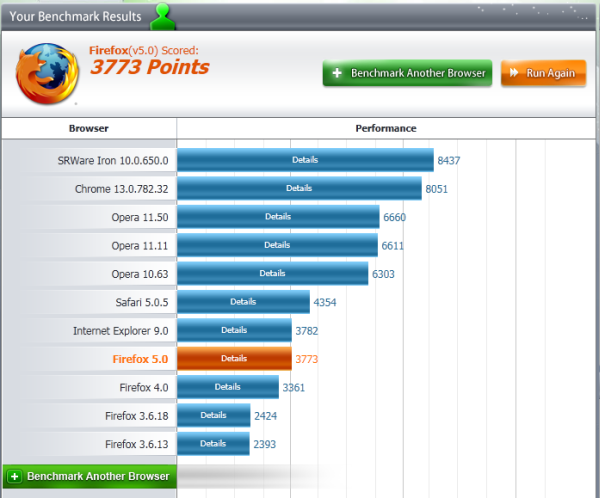 IE9 still seems to be extremely optimised for this benchmark, so should be taken with a pinch of salt. Safari does seem to be lagging behind here now though. All three new versions (chrome 13, Firefox5, and Opera 11.5) have increased their HTML5 comparability. Chrome still leads the way, while Opera and Firefox are tied.